I’m delighted to see that That Boutique-y Whisky Company doesn’t just stick to Scotland, and here we have our first international whisky of the season – from India, of all places. 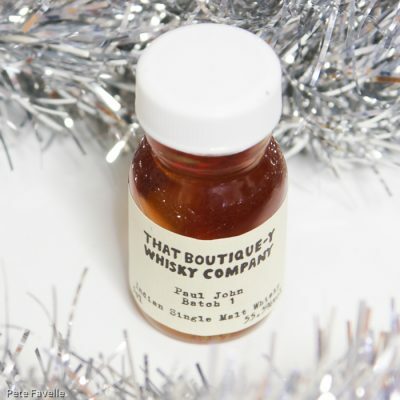 Having previously been impressed by Paul John’s whisky, I’m eager to see what TBWC can offer! Paul John Batch 1 is a marvellously dark dram, with an impressive 55.5% ABV. It’s sufficiently dark that I’m assuming it’s been finished in some sort of sherry or rum cask, although information on that is hard to come by. The nose is wonderfully rich, full of dried fruit and dark honey. Vanilla slowly comes through along with soft, earthy peat. Water brings out oak, and touches of peach. In the mouth it’s creamy, big and powerful; lots of alcohol heat on the tip of the tongue, sweet dark honey and a lovely warm peat background. Watered, the alcohol is tamed and there’s more dried fruit, warm wood and gentle smoke. A little overpowered neat, with a splash of water this is a wonderful big whisky – 4.5 stars, I could drink this all day! Many thanks to Master Of Malt for providing their That Boutique-y Whisky Company Advent Calendar this year.